Do You Want To Return To Vietnam? It’s usually asked with the assumption that I’m from Vietnam. No matter where I lived, in Louisiana, central New York, or even the DC area, the speaker usually assumes that Vietnam is my homeland. No one ever asks if I want to return to Louisiana, where I grew up. I’d love to visit Vietnam. Not to reacquaint myself with “homeland,” but to eat. That’s right. To eat. Street food, restaurant food, whatever. When the person hears my response, they’re taken back a bit. I don’t know what else to tell them without being rude. It’s almost akin to being asked, “Where are you from?” and waiting for a country that isn’t the US. How would you respond? Back to the Vietnamese food. I love watching Anthony Bourdain’s No Reservations episodes when he visits Vietnamese. He even loves it there. I know he’s mentioned how he would like to live there. 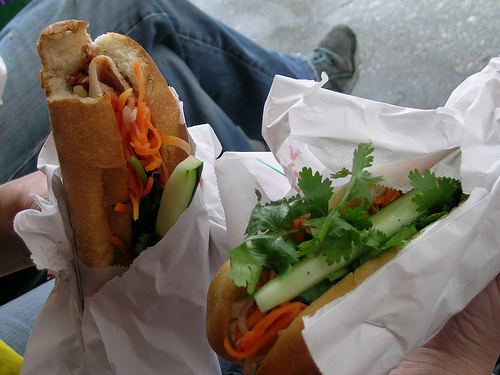 Dang, now I want some banh mi or some spring rolls. This post was inspired by The Art of Hearing Heartbeats by Jan-Phillipp Sendker. When Julia travels to Burma to search for her missing lawyer father, she discovers much more than she expected. Join From Left to Write on February 1 as we discuss The Art of Hearing Heartbeats by Jan-Philipp Sendker. As a member of From Left to Write, I received a copy of the book. All opinions are my own. Affiliate links are included int his post. Banh mi photo by alexrheadrick via Creative Commons.